By Hirukuma and Ituwa Kato. Released in Japan as “Jidou Hanbaiki ni Umare Kawatta Ore wa Meikyuu wo Samayou” by Kadokawa Shoten. Released in North America by Yen On. Translated by Andrew Prowse. 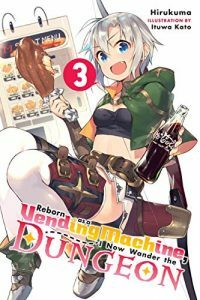 This third volume of Reborn as a Vending Machine tries to expand the world that we’re in and give our hero a bit more insight into goals for the future. As we’ve seen, a lot of his “what should I do next” thoughts involve collecting points to level up, get new products, etc. Here, after a very amusing eating contest, Shui from the mercenary group wins the right to have Boxxo for the entire day, and takes him to the first floor of the dungeon, home to (try to contain your surprise) a group of poor yet plucky orphan children. The dungeon, it turns out, needs to have someone reach a certain level in order to get to the second floor. So for the unwanted kids, or whose whose parents have died, they have this. It reminds Boxxo to, if you’ll pardon me, think outside the box and realize this is a real life world he’s now in, not just a game RPG. There’s also his relationship with Lammis, which continues to be chaste (he’s a vending machine) but still have that “I am a harem manga protagonist” feel to it. Lammis is clearly deeply in love with Boxxo, and as such will try to overcome her limits in order to stay by his side (she’s terrified of the supernatural, and the last half of the book involves nothing but that) and also gets easily embarrassed around him (she tries to hide her heavy period, which doesn’t work but does allow Boxxo to show off that he can also dispense sanitary pads). As for Boxxo, his emotions are still a bit flat, but it’s pretty clear he likes Lammis quite a bit. I’m not entirely sure where the series’ endgame is here, but am content with it simply being cute and chaste – it really does get pretty adorable. Less adorable is the climax to the third book, where our heroes defeat a skeleton lord and then discover the demon behind the skeleton lord, who is vastly more powerful. For a moment I wondered if the book was actually going to kill off a few regulars – the villain actually stops Hulemy and Shui’s hearts, and you briefly think the book might be going in a dark direction. But no, it’s just an excuse for Boxxo to recall that AED stations can also be part of a vending machine, and that he can use that to save their lives. Also, he has telekinesis now, though we don’t get too much of a sense of how he’ll use that. Honestly, you don’t want this series getting too dark – it’s about a guy reincarnated as a vending machine – so I’m fine with his breaking out vaguely deus ex vending machina powers so that everyone is fine again. While the series has a number of volumes after this in its webnovel version, Kadokawa hasn’t published a new volume in about two years, so this may be all the vending machine we see. (The author has been writing KonoSuba side story volumes, which may explain it.) Which is a shame, as despite its truly ridiculous premise I found myself drawn into each book, trying to see what would be happening next. I’ll miss you, Boxxo.